I am a firm believer in the critical role post-secondary education plays in raising journalism standards in developing democracies. Student publications are the best guarantor of sustainable reform. I have had the honor to launch or, in the case of The Bullet, to nurture the student publications below. Many of the student journalists behind these publications are now leaders in their nations’ journalism communities. UB students soak up the first issue of the Horizon. 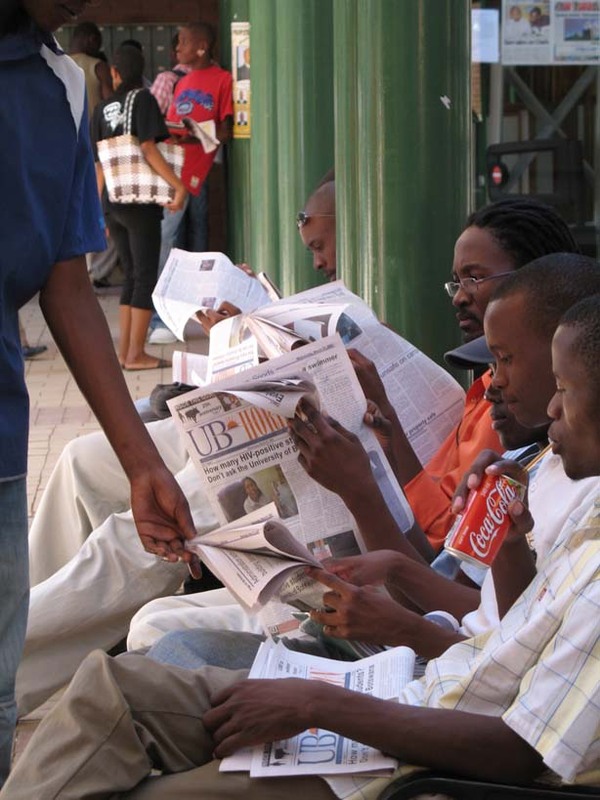 UB Horizon (Botswana, 2007) This, the first student newspaper to be published at the University of Botswana, achieved instant popularity among students and beyond. Journalism students wrote and edited the stories, sold the ads, set up a distribution system and laid out the paper. The page 1 story here set the national record straight on the real HIV/AIDS precedence rate in Botswana. Common knowledge held the rate at around 30 percent. As you can read, a closer look at the research revealed a much lower number. This was a topic that the national dailies wouldn’t touch until the UB Horizon broke the story. The Horizon made a profit on the second issue and is still going strong today. Thanks to the McGee Journalism Fellowship in Southern Africa for making this new newspaper possible. 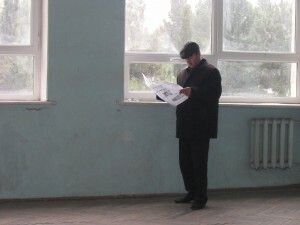 A BSU faculty member absorbs the school’s first independent student newspaper in Baku, Azerbaijan. 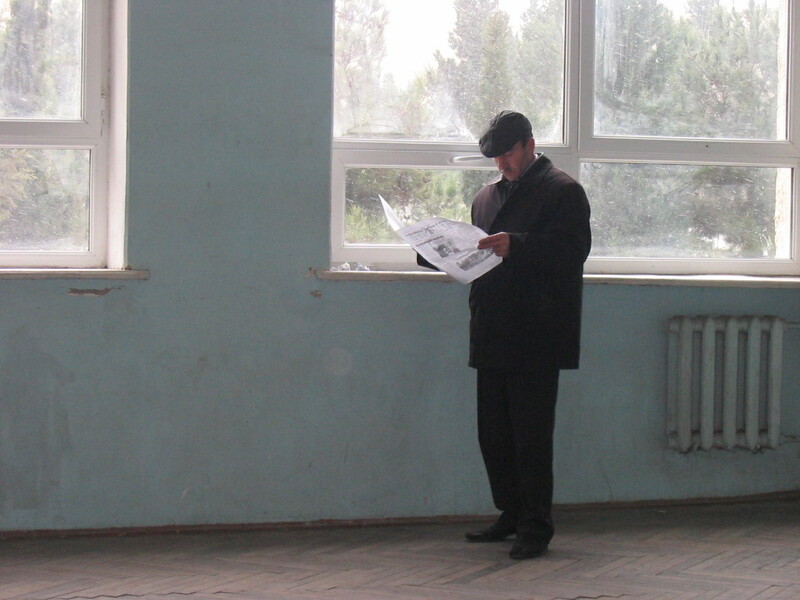 Dayirman (“The Windmill,” Azerbaijan, 2006) My Baku State University journalism students went straight from their one-semester skills course graduation celebration to an empty classroom to plan the first edition of “The Windmill,” the first independent student publication in the school’s history. They raged against the empire. One student wrote a story asking why students were not allowed to use an olympic-sized swimming pool at the university that was built with public funds. She and some of her colleagues were later summoned to appear before the vice-rector, who told them to retract their stories. They stood by their perfectly accurate stories, and they were not disciplined. BS-U was not ready for press freedom, however, and the paper folded after the second edition. But the students had learned what journalism feels like. Burmese journalist Hla Hla Htay interviews a vendor at Phnom Penh’s Central Market. Hla Hla is now Yangon bureau chief for Agence France Presse. The Searchlight (Cambodia, 2004) This in-house training publication was produced by working journalists from Viet Nam, Laos, Burma and Cambodia to test their skills at the end of a two-month course at the Southeast Asia Media Center, a project of the Independent Journalism Foundation. 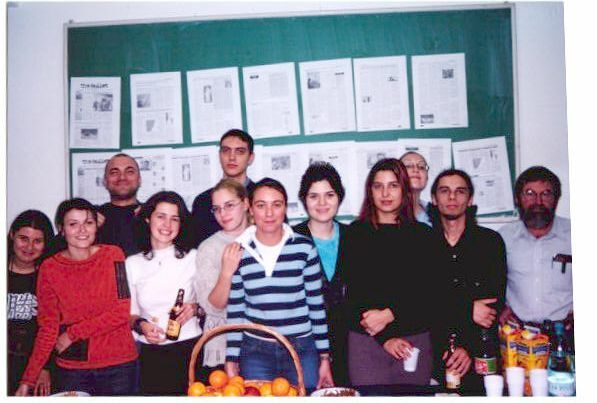 Negru pe Alb (Bucharest, 2003) A class of Roma journalists produced this newspaper, “Black and White,” at the end of a basic skills training course at the Center for Independent Journalism, Bucharest. The lead story chronicles the lives of a group of glue-sniffing boys who said they work as petty thieves for a neighborhood handler. University of Bucharest journalism students celebrate their first issue of The Bullet, mounted on the wall in the background. The Bullet (University of Bucharest, 2003) This feisty student monthly published in English and Romanian regularly broke news that the Bucharest dailies followed. The students came up with the name and flag. The reporter that covered the student suicide story on page 1 is now a staff writer in the Reuters bureau in Bucharest. Three of my students went on to earn advanced journalism degrees at American universities. Thanks to the Knight International Journalism Fellowship program for sending me to Romania. What great work you’ve done in all these places! Working on the UB Horizon was an incredible experience. I learned more there than in all my classes combined, and it’s so good to see it still going strong four years later. Thank you for teaching us how to stand up for the truth and carry out our work with integrity.